Chile is located along the western coast of the southern cone of South America, between the highest section of the Andes mountain chain and the Pacific Ocean. Its shape is unique: it is one of the longest countries in the world, with 4,300 km (2,672 miles) long while also one of the narrowest, with an average width of only 180 km (112 miles). It has every type of climate found on the planet with the sole exception of tropical weather. The official language of Chile is Spanish, and its currency the Chilean peso. The population is mestizo, a mix of European and indigenous ancestry, whose traditions are still perceived in some parts of the country. The literacy rate is 94%, standing out as one of the highest in Latin America. Chile is described as having three geographical areas. 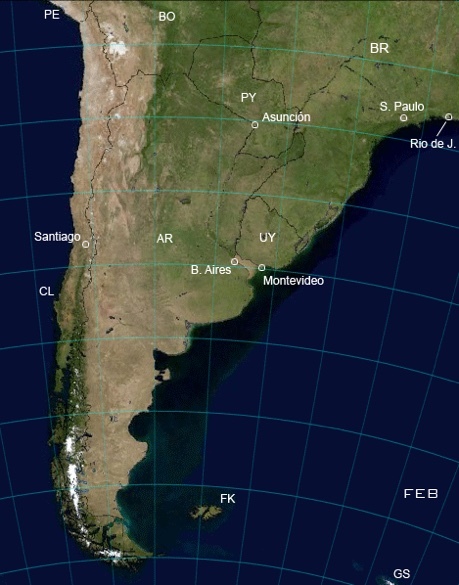 The first one, continental Chile, is a long strip of land that runs down the western side of the Southern Cone, extending between parallels 17°29'57"" S and 56°32'12"" S, mainly from the south-eastern banks of the Pacific Ocean to the highest peaks of the Cordillera de los Andes. It spans 4,270 km (2,653 miles) long, a maximum width of 445 km (276 miles) at 52°21' S and a minimum width of 90 km (56 miles) at 31°37' S. It borders Peru to the north, Bolivia to the northeast and Argentina to the east, totaling 7,801 km (4,847 miles) of land borders, and the Drake Passage to the south. The second area, insular Chile, is a set of islands of volcanic origin in the South Pacific Ocean: the Juan Fernández Archipelago and the Desventuradas Islands, belonging to South America, and Salas y Gómez Island and Easter Island, located in Oceania. The third area, Chilean Antarctic Territory, is an area of Antarctica covering 1.250,257,6 km² (7,768,738 sq mi) between the meridians of 53° O and 90° O, over which Chile claims sovereignty, extending its southern border up to the South Pole. This claim was suspended according to the provisions of the Antarctic Treaty to which Chile is a signatory party. As a result, Chile defines itself as a tri-continental country. Chile’s coastline is 6,435 km (4,000 miles) long and exercises exclusive rights, claims in varying degrees, and sovereignty over a maritime area known as the Chilean Sea. This includes four areas: the territorial sea (120,827 km2), the adjacent area (131,669 km2), the exclusive economic area (3,681,989 km2), and the corresponding continental platform (161,338 km2). According to the 2002 Census, Chile has a population of approximately 16,000,000 inhabitants. The unusual north-south extension of Chile, equivalent to crossing Europe from the far north of Norway to beyond the most southern tip of Spain, gives rise to a great variety of climates with the only absence of humid tropical climates. In the North, regions I, II and III have areas where rainfall has never been recorded, such as the Atacama Desert, and others where sporadic rainfall in winter has given rise to an explosion of flowers in spring, a phenomenon known as “Flowering Desert”. In this vast section of the country, the coast has a moderate climate, with foggy mornings and sunny afternoons. As the altitude increases, temperatures during daytime rise and drop at night. In the highlands (altiplano), temperatures plunge below freezing at night, even during the summer. This season is also known for the “Bolivian Winter”, a phenomenon that brings occasional rain and hail storms. Further south, between regions IV and VIII, the landscape turns Mediterranean, with valleys and coastlines boasting a temperate climate, well-defined seasons, dry summers and relatively rainy winters. Between regions VIII and X, a mild rainy climate sustains vast native rainforests and a flourishing agricultural industry. In regions XI and XII, the climate is rainy, moderately cold, and especially windy along the coast and the Patagonian pampa. At the far end of the continent, temperatures are lower and there is less rainfall. Easter Island and the Juan Fernández Archipelago enjoy a subtropical climate with pleasant temperatures and moderate humidity that varies very little throughout the year. The national flag of Chile, known as “La Estrella Solitaria” (the Lone Star), was officially adopted 200 years ago on October 18, 1817. It is divided into two horizontal stripes, blue and white on top and red on the bottom, with a white five-pointed star in middle of the blue square. The main interpretation of the colors of the flag regards blue as representing the sky and Pacific Ocean, white for the snow-covered Andes Mountains, and red for the blood spilled by national heroes in their fight for independence. The star symbolizes the three powers of the Chilean State (Executive, Legislative and Judicial) that ensure the nation’s integrity. Other interpretations indicate that the single star refers to a unitary State unlike, for example, the multiple stars of the flag of the United States that represent a federal State. 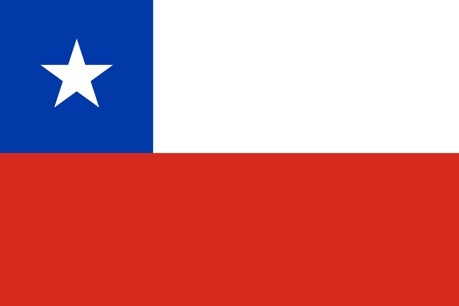 Nevertheless, considering the verses of Canto XXI of the epic poem La Araucana (1569), the colors of the current Chilean flag would go back to the tricolor bands used by the Mapuche toquis during the Arauco War against the Spanish Conquest, while the star would represent the “star of Arauco”, according to Bernardo O’Higgins. The coat of arms is the heraldic emblem that officially represents our country, adopted 184 years ago. The design of the coat of arms is defined in Supreme Decree 1.534 of the Ministry of the Interior, published on December 12, 1967, that established the use of national emblems and systemized and consolidated several legal and regulatory standards on this subject. According to the decree, the coat of arms has a silver five-pointed star in the center of a shield divided into two equal parts, with blue on top and red on the bottom. The official shape of the coat of arms was approved by War Decree Nº 2.271 on September 4, 1920. The shield also has a plume of feathers in three colors: blue, white and red. It is supported by a huemul on the right and a condor on the left and each are wearing a golden naval crown. 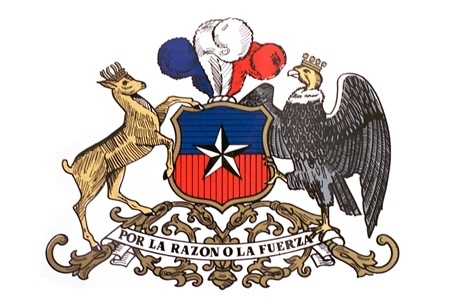 The motto appears below on a ribbon crossing an elaborate scroll that reads "Por la razón o la fuerza" (“By right or might”). The first national anthem dates back to 1819. Composed by Manuel Robles and the poet Bernardo de Vera y Pintado, it was first performed on August 20, 1820 at the Domingo Arteaga Theater. It became customary to sing the anthem before every performance at the theater. At first, everyone would stand up to sing, however, the practice of singing it every evening slowly decreased until it was only sung on Independence Day. The second Chilean national anthem was created by Spanish composer Ramón Carnicer while in exile in England because of his liberal ideas. Acting on the criticism that the first anthem was receiving, Mariano Egaña, Chilean Minister in London, asked Carnicer to create a new composition based on the same text by Bernardo de Vera y Pintado. The Spanish musician composed the hymn in 1827, debuting on December 23, 1828 at a concert by the Philharmonic Society at the Arteaga Theater. Years later, the Government of Chile commissioned the young poet Eusebio Lillo with a new text that would replace the anti-Spain poem of Vera y Pintado but retaining the original chorus “Dulce patria, recibe los votos”. Carnicer’s hymn as well as Lillo’s verse had to overcome considerable resistance before it prevailed over its predecessors.